The key to a good settlement is to find & rent the perfect flat in Berlin to live in. I would say it’s the first thing you have tick off your list along with finding a decent job. Competition has grown considerably in the past few years as the city has attracted more and more people. It’s not as easy as it used to be. Here are a few tips to stay ahead of the wave. Renting a flat in Berlin : Mission impossible ? Finding a flat in Berlin has become increasingly difficult the past years due to the general gentrification of many parts of the city. Rents are have also gone up due to the renewal of the city since the beginning of the 1990’s. So if you have heard it is very easy to find a flat in Berlin, you might be disappointed. It is however somewhat still easier than in other cities in Europe like Paris or London. With a little bit of patience (between 2 weeks and 2 months depending on your money/luck/connections) and organization you should be able to find a flat in Berlin. I will only cover here how to find your own flat to rent in Berlin. If you want more information about finding a roommate or a flat share, please go to the dedicated page this way. If you somehow have the means to buy your own flat instead, i’ve also made a guide to buy an apartment in Berlin this way, based on my experience. Immobilienscout24, Immonet and Immowelt are sites with a lot of serious offers. I’d recommend creating an account on all 3 of them to receive daily updates about offers with your search criteria (search agent). Some offers are not on one and vice-versa. It’s easy and it’s quite important as it allows to be fast and be the first to reply to new inserts. Speed is key in Berlin. 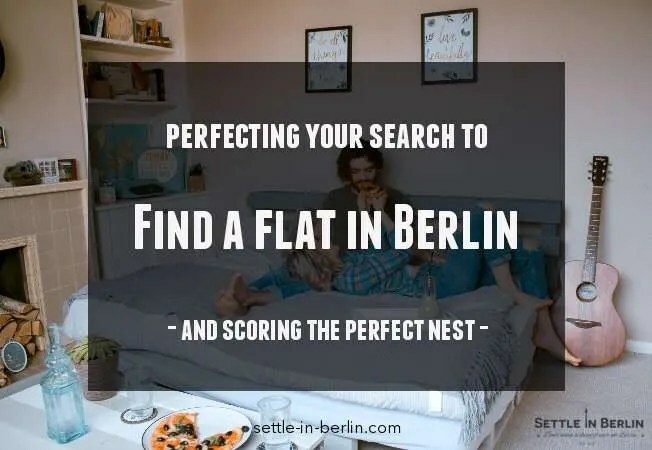 Be aware that most of those websites are offering unfurnished flats in Berlin, so i also made a little guide on the best ways to find furniture in Berlin here too. Those ads are also using a lot of abbreviations to describe the flat. You can find at the end of this post a little glossary of abbreviations often found on those websites. It might come useful. One more thing: don’t forget the deposit which can be worth 1 to 3 month of rent to pay at once. As a reference for rent price, here is a map made by ImmobilienScout in 2015 to show the average price depending on the location in the city along the Ubahn-Sbahn lines. It shows the average price of a 30-year-old 70m2 flat, without utilities (kalt-miete). In 2018-2019, you can roughly apply a 1,5 ratio on top for closer to reality prices. Another way to check is to look at the “Mietspiegel” (Rent mirror), which is a database run by the city, keeping track of prices across districts. Enter your street in the tool to check the rent prices. As a rule, total costs are structured that way : Rent (Kalt Miete) + Running costs (Nebenkosten) + Utilities (Heizung & Strom). In some cases, heating costs are included in the running costs when there is central heating in the whole building. Just be sure to include all costs when evaluating an opportunity. Remember that you will also have to open an electricity & gas contract on your own as well. It is usually not done by the landlord. More info on rent costs, cold or warm in this post. Keep in mind, these prices don’t include the “opportunity costs” of getting a flat in Berlin. This means that since there is a harsh competition, actual prices may be higher than the theoretical ones. To be honest, it can be quite hard if you want a flat in the hippest corners of Kreuzberg or Friedrichshain. That’s because EVERYONE wants to move there. In the most wanted areas, it can be become quite intense and some potential tenants don’t hesitate to come to directly with all necessary papers to directly take the flat if they are interested. It might be a good idea to do the same. It’s also reasonable to expect mass group visits in those areas. A useful paper that might help your case is a “Mietschuldenfreiheitsbescheinigung” (Roughly; free of rent-related debts certificate). It is a paper provided by your former landlord that states your left your tenancy without any debts. If you come from abroad, make one in English with this long German word as a title. It it not guaranteed every landlord will accept it, but it’s better than nothing. Here is one in German for reference. An alternative strategy might be to find people soon leaving their flat and looking for a “Nachmieter” to take it over, the new tenant starting a new contract with the landlord. Several full-services agencies are also offering fully furnished rentals with an extra fee. They usually don’t make you pay anything until you sign the contract. Then the fee is included in the rent. The rent is higher than average but it does sometimes comes with cleaning & other services. This might a good solution for the first few months of your life in Berlin or if you come only for a short-time for a project or something. This is also a good solution to get around the evil circle of “no-flat -> no anmeldung -> no bank account -> no-schufa -> no-flat” issue. Landlords don’t require SCHUFA records with those platforms. A good solution to get around the evil circle of “no-flat -> no anmeldung -> no bank account -> no-schufa -> no-flat” issue. Tip 1 . Do not hesitate to first move in a temporary rental for the time you rent a flat in Berlin, it’s very easy to rent out a room for 2 weeks to some person going on holidays for example. You’ll be then more efficient. You can of course go with AirBnB or consider Wimdu, which is a German competitor to AirBnB. Update April 2016: Those services are now regulated in Berlin. Hosts now need a license to be able to list their property on those platforms or alternatively, only rent a single room while still having residence at the same address. In any case, the guest can never be fined in case they stay at non-permitted listings. You can still use those services with peace in mind. Tip 2 : As of October 2015, the owner of the flat has to pay any agency fees when renting out a flat and not the other way around. Good news for tenants. Tip 3 : You will find that inserts have sometimes strange abbreviations to describe the place. Here is a list of the most common ones. NK (Nebenkosten) = usually water, sewage, trash collection, Hausmeister service, etc. Hi All. The website is fantastically helpful, it’s greatly appreciated:) I am just preparing to move to Berlin (from the UK); read and heard already about the craziness of the rental market, but still cannot figure out – why these humiliating queues during viewings exist at all? For example, in England the market is very ‘price-effective’; typically landlords price their apartments slightly higher than a real price is, and simply wait for a tenant who could afford it. So, everybody looks for a flat in his/her own ‘price bracket’; say, if I know that I can spend £1200 for one-bed – there is a choice of flats for this price. If I want something better – I am just increasing my budget and have the new choice of available flats, but I am not trying to find something that cost £1700 for the price of £1200. But I have an impression that in Berlin is happening exactly this – people hope to rent a fantastic apartment with a small budget. What is the reason that landlords (or agents?) run these ‘tenders’ among potential renters instead of just increasing prices? Or maybe there is a legal barrier and landlords cannot put prices as high as they want? Don’t forget to have ready your Schufa, Mietschuldenfreiheitsbescheinigung, salary statements or future contract and copy of your ID card. I was always asked for those! Thanks for the tips. I’d like to express my huge disappointment from the process of flat hunting in Berlin. I couldn’t even imagine that such havoc can exist in Germany! I’ve lived in London for 15 years and renting has NEVER been a problem! Here it is really humiliating to be part of an open viewing with 10-20 other people, as desperate as yourself, trying to impress some agents who don’t even speak English! Yes, it’s Germany but the last time I checked, English is still the global language! The craziness of people subletting their room or flat for a week, month and so on is something I have never seen in the UK! Nothing to say about the huge deposit for an empty flat, which diesn’t even have the necessary white goods in the kitchen! Crazy, overpriced, really disappointing! This humiliation of people who have come to contribute to the economy of the country, pay taxes and spend most of their money in the country is intollerable and inhumane! This whole situation should probably be reported to the Hague court! Shame, Germany! I have to say that moving to Berlin is much much more harder in reality. Looks like Wunderflats require Schufa even for short stay such as 2 months. For such short term it simply makes no sense, since majority of lump sum will be paid at the beginning of a lease. Majority of flatshare websites just waste your time by putting lower prices in headline and different in a description. Beware of gender, age and all sort of other requirements. On other hand city is great – people are more relaxed and enjoying life than in any other European capital city. This article is a bit dated, especially the map with the prices. Now prices are about 50% more. I am just mentioning this because it gives misleading information.